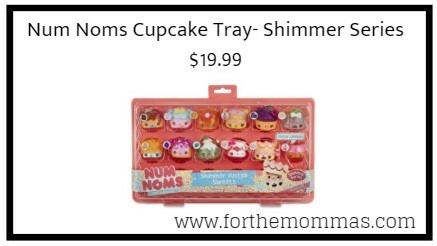 Walmart has Num Noms Cupcake Tray- Shimmer Series for $19.99. Choose in-store pick up to save on shipping charges. To create your own flavor fusion, mix a Num and a Nom. It’s a recipe for mischief with so many wacky combos. Num Noms are the cutest, mini dishes! And they smell SO delicious! Dig into a whole tray of scented, shimmery dishes with Num Noms Cupcake Tray. Each tray features eleven scented, glittery Nums, including one mystery, and one glitter lip gloss Nom.